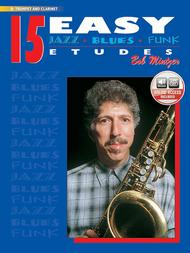 15 Easy Jazz, Blues & Funk Etudes (B-Flat Trumpet & Clarinet). Composed by Bob Mintzer. For B-Flat Trumpet & Clarinet. Instrumental Series. Blues; Jazz; play along. Book & CD. 36 pages. Published by Alfred Music (AP.ELM00033CD).ISBN 0769297935. Blues; Jazz; play along.Written for a wide variety of musicians, 15 Easy Jazz, Blues & Funk Etudes will appeal to both aspiring players and to more experienced musicians. For the younger player, particular care is given to range, rhythmic figures and overall playability. The more accomplished musician will appreciate the high level of musicality, the lyrical compositions and the opportunities to improvise. Either way, the format is simple: Bob Mintzer plays and demonstrates each etude with a stellar rhythm section on the included CD. You learn each etude slowly. When ready, you play the etude with the CD accompaniment.Recorded Acc. Available.